Google Plus Profile Card is not the official name but basically it is more luxurious than Twitter Profile Card offers us. Get the needed tips for coding. Yes, Google Plus Profile Card or rather Google+ Badge for Profile is now available with the API, function reference and lot of options. Can you remember the beta days of Google Plus when we offered an unofficial Google Plus Profile Card – just a graphical thing. This Google Plus Profile Card is quite important for those who among us are the typically said ‘First Generation Google Plus Users’ – there was no Page and we still use our Google Plus profiles more intensively than page. For easiness, we are continuing the name Google+ Badge for Profile as Google Plus Profile Card in the rest of the guide. The thing you can see on this website’s sidebar below the 300×600 Half Page Ad Unit. It looks a bit different due to custom CSS, but the basic thing you can easily understand – it is just a miniature of your Google Plus Profile. Today, it is very important to include the special features offered by Google, Twitter, may be Facebook. It not only increases the number of Twitter Followers, but also helps the bots to understand who you are. It basically falls among the needed basic tweaks for Optimizing Name in Google Search For Professionals and Famous Persons Read more: Optimizing Name in Google Search For Professionals and Famous Personalities. Quite sure there will be some junk Plugin for WordPress in future to add “automatically” or may be have something. But you need no such Plugins or Widgets. Copy pasting only the chunk of code in a Text Widget in WordPress will work fine. So this is all about the way of customization. Obviously you can wrap it with CSS to match the look of your website. This Article Has Been Shared 5328 Times! 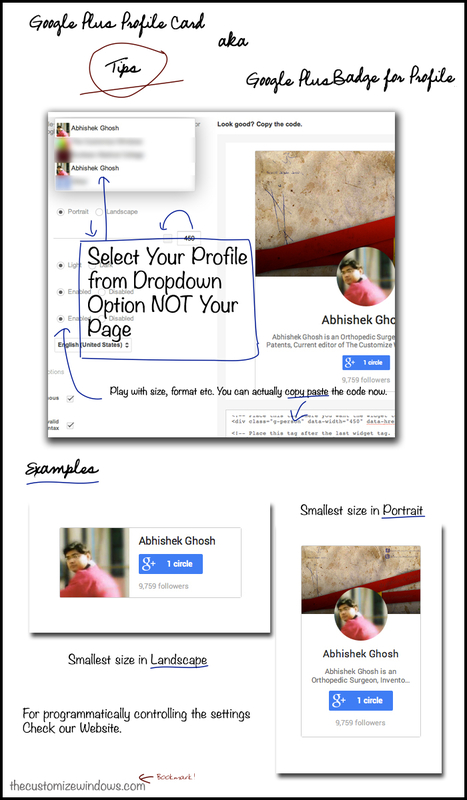 Cite this article as: Abhishek Ghosh, "Google Plus Profile Card aka Google+ Badge for Profile," in The Customize Windows, July 9, 2013, April 25, 2019, https://thecustomizewindows.com/2013/07/google-plus-profile-card-aka-google-badge-for-profile/.